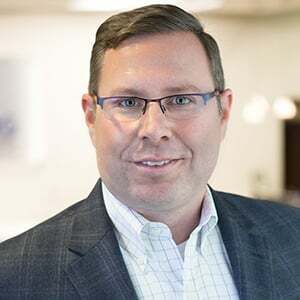 Cassling President Kyle Salem, PhD, recently sat down with prostate MRI expert Dr. Arnold Friedman, professor of Clinical Radiology at the University of California-San Francisco, and discussed trends in prostate MRI, its future and its impact on the industry. The following is an interview transcript edited for clarity and length. If you prefer, you can listen to the full podcast in the player below. Dr. Salem: Let’s start out with a little bit of your background. What initially attracted you to prostate imaging with MRI, especially considering you started so early when MR was just becoming prevalent as a clinical modality? Dr. Friedman: I was at Temple University in 1985 and became interested thanks to a urology resident who was designing an endorectal coil. At that time, MR with the body coil was not very good for the prostate. Also, my grandfather died of prostate cancer. It's a big killer and doesn’t get as much attention as it deserves. I think men have to do a better job of teaming up and pushing for additional research and funding to decrease morbidity and mortality in prostate cancer. Dr. Salem: Yes, that's certainly a significant area for us to look at in terms of putting resources toward developing imaging technology to improve patient lives. 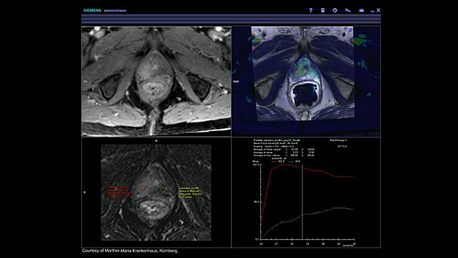 So what role do you think prostate MRI plays in both the diagnosis and the treatment-monitoring process? 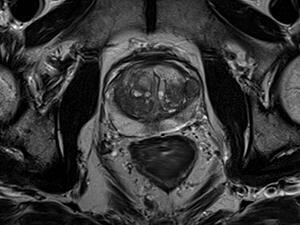 What's really the impetus for using MRI as a tool when imaging the prostate? Dr. Friedman: [Prostate cancer screening] is now done with the PSA [Prostate Specific Antigen] and, if the PSA is positive, you can randomly biopsy with transrectal ultrasound (TRUS) guidance. The downside is poor differentiation between aggressive, potentially lethal cancers and indolent cancers where survival is not affected. It’s estimated that one cancer death is prevented for every 12 to 37 prostatectomies, which means there's a lot of unnecessary treatment. Prostatectomy or radiation therapy has roughly 30 percent incidence of impotence and/or incontinence, which are serious issues. The over-treatment rate is thought to be between 27 and 56 percent. It's controversial whether or not you should use PSA for screening. It’s been roughly three decades since the first prostate MR. Initial results were good, but they were not reproducible. The market potential was not substantial until about ten years ago when new techniques started to be developed. In addition to T2-weighted imaging, we now have diffusion-weighted imaging, dynamic contrast enhancement imaging, better coils, 3T scanners, and the ability to use surface coils instead of endorectal, etc. We've also developed PI-RADS [Prostate Imaging – Reporting and Data System], which is a standardized reporting system so that one institution's reports can easily compare to another institution’s reports. Dr. Salem: Is [prostate MRI] something that you would consider almost every facility as needing to be able to offer to patients? Dr. Friedman: It's hard to say. If you convince administration to purchase the necessary software, but only have one magnet, that can be a roadblock. For imaging centers, if you have open slots for MRI exams, this is definitely a marketing opportunity to build a prostate imaging program and to sell those empty slots. Dr. Salem: We've actually had an imaging entity opened locally here in Omaha that is built purely on the idea of prostate MRI without the use of an endorectal coil. The entire business is around screening and screening prostate MRI. So, if I was running a facility and wanted to launch a prostate MRI program what do I need to know? Dr. Friedman: To launch a successful program, you must find a local urologist who is willing to send you patients. You have to market the capability to the urologist and demonstrate to him or her that you'd improve their patient’s care, that you’d make their life easier. That’s how you get patients. CT colonography hasn't really taken off, but the only way to develop a CT colonography practice is to get to know the gastroenterologists. Demonstrate to the gastroenterologist that it's not going to take away their colonoscopies. Similarly, you have to convince the urologist that it's not going to decrease their number of ultrasound-guided biopsies. I would market it to them by saying, "Hey, you've got a patient with an elevated PSA. Your TRUSguided biopsy is negative, so order an MR. Let's see what we can find and let's see how we can help you with your second biopsy." If you're successful doing that, you can expand your relationship. Dr. Salem: Do you see MR ever taking a front-line role? Maybe even replacing the use of the PSA blood test, or do you think it's more of a secondary or complementary modality to be used in conjunction with biopsy? Dr. Friedman: Right now, it's not a tool for screening or recommended for screening. This could be an area of research and development in the future for both Risk Assessment and Screening. I don't think any insurance company is paying for screening MRI for prostate right now. Dr. Salem: That's exactly right. The example I mentioned is using it purely as a cash-and-carry sort of business. Dr. Friedman: Right. I see the most promising development along the lines of breast MRI, which is reimbursed if you meet certain criteria for being high-risk. So I could see that happening quite easily, but we will need more controlled studies to prove efficacy. Dr. Salem: How do facilities that want to start doing prostate MR ensure that their radiologists are capable of handling the read for prostate MR? Dr. Friedman: The radiologist should be familiar with the PI-RADS system for reporting. There are numerous review articles that they can read to learn about prostate imaging. But another opportunity is DocPanel. DocPanel has a panel of radiologists—myself included—who have varying areas of expertise. We offer second opinions for patients who have questions about their exam. We look at their exams and reports and do an over-read. We also have developed relationships with imaging centers, where imaging centers send us their examinations to do primary reads [i.e., teleradiology] for certain specialties or even all reads. We also do B-reading; B-reading is done by people who've passed an examination given by the National Institute of Occupational Safety and Health, documenting special expertise at reading chest X-rays on patients exposed to silica, asbestos and coal. We also offer CT colonography (Virtual Colonoscopy). If somebody wants to do that, we can set up their CT scanner, teach the technologists and help them start their program with their own radiologist(s) or [else they can] send the examinations to us. Dr. Salem: Do you consider MR to be superior to other modalities or just a component in the diagnosis of whether we're talking about something like BPH [Benign Prostatic Hyperplasia] versus an actual cancer condition or whatever other conditions someone may have been referred for? In other words, are the results that we get from MR better than what we get from other modalities? Dr. Friedman: Without any doubt MR is the best modality for imaging a prostate for cancer. As part of looking for cancer, you're looking for lymphadenopathy in the pelvis or abdomen. MRI isn't necessarily better than CT for doing that, but the patients are already getting an MR for the prostate, so you might as well look for the lymphadenopathy as well. MR is much better than CT or ultrasound in looking for a local extent of disease—whether or not the cancer has gone beyond the capsule. MR is better than transrectal ultrasound when targeting biopsies, especially when the PSA is persistently elevated and the TRUS biopsy is negative. This typically requires the patient to come back and get a lot of blind biopsies. MRI is like a smart missile because you can find and biopsy just the abnormal area. In addition, when a patient has elevated PSA and a rectal exam is not particularly suspicious for cancer, some [physicians] advocate for surveillance or watchful waiting, as well as repeat biopsies. These patients can be followed with MR to look for any development of any areas in the prostate that look like cancer. Finally, MR is also very good for looking for recurrence in patients after surgery or radiation therapy. Patients will come in with post-treatment newly elevated PSA. This means that they had their surgery or their radiation and their PSA went back to normal but after a year or two it started going up again. So you want to find the recurrence and MR is better than anything else [at] looking for local recurrence. Dr. Salem: We’ve seen prostate MRI utilization grow over the last 10 to 20 years. What has been your experience in terms of growth rates? Dr. Friedman: It's still slowly growing. From my perspective, when something is new in radiology and in medicine, there's a slow growth over many years, then you hit an inflection point and it takes off. Digital radiography was like that. We had CR; CR was pretty good. Digital cost more, so you’d ask yourself, why should I buy digital? The digital market share started slowly and was only used in places that had very high throughput because otherwise you couldn't justify the cost. But then the cost came down and all of a sudden it hit an inflection point and it took off. At this point, CR is practically toast and everything is digital. This may or may not happen with MR. Who knows? But right now, I think we're before the inflection point, we’re just seeing a slow increase in utilization. Dr. Salem: If you could predict the future, is there a key sequence or capability that would impact utilization? Perhaps a guidance around screening? What would it take for prostate MR to hit that inflection point? Dr. Friedman: One thing would be robust research showing that prostate MR is useful for Risk Assessment and Screening in the same way breast MR is useful for Risk Assessment and Screening. In other words, having a defined patient population [that’s eligible]. Like breast MR, if you have a first-degree relative or you have the gene, you are eligible for Aggressive Risk Assessment and Screening. For prostate, if we develop some yet undefined factors, say, African-American, your father had prostate cancer at an early age, etc. ; if we stratify the population for those patients who have increased risk it would help prostate MR take off. One of the problems of breast MR is that it has a relatively high false-positive rate. I don't think that's true with prostate MR. I think prostate MR probably has a greater positive predictive value than breast MR.
Another thing that might get it to take off would be evidence that some of the newer focal therapies are good and are able to replace traditional surgeries and radiation techniques. Things like laser ablation, cryoablation, high-frequency ultrasound ablation, all those are best monitored by MR guidance in real time. If those take off, then you're going to want a pre-therapy MR to see where the cancer may be and where the directed therapy may be, and then you'll have a real-time MR guidance for the laser ablation [or] cryoablation. To learn more about prostate MRI, contact your local Cassling/Siemens Healthineers representative. 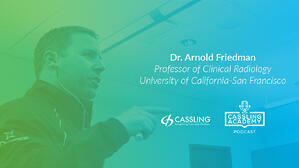 Dr. Friedman is a Professor of Clinical Radiology at the University of California, San Francisco. He has been teaching and mentoring since 1979; he currently teaches and supervises UCSF Fresno residents and fellows at the Veterans Affairs Central California Health Care System. He is a member of DocPanel and a reviewer for multiple peer-reviewed journals, such as the American Journal of Roentgenology. He has authored approximately 130 peer-reviewed publications and edited/authored 6 textbooks and 7 book chapters, including Clinical Pelvic Imaging, which covered prostate MRI. He started working with prostate MRI in 1985. Dr. Friedman is a collaborator in an NIH-funded research project, Fast Parametric Imaging of the Liver, to develop and evaluate parametric MRI methods for the improved diagnosis of metastatic and diffuse of liver disease.